With the latest new iPhone around the block, Apple is changing mobile history again. This is the tenth anniversary of the iconic product from an iconic company, that has changed the computer industry, the music industry and so many other industries, forever. So, how do we gear up to use our brand new iPhones to their fullest potential? There are so many steps that you need to get done before you make the jump to a new iPhone. You need to make sure that all your photos, audio, video, music, documents and all the other important stuff are moved to your PC. So, in order to help you with that, we are introducing you to a software, WinX MediaTrans. WinX Media Trans is a popular iTunes alternative in the niche and are quite familiar with the pros and cons of executing a cross-platform media backup without any hiccups, especially if you are not that tech savvy. As someone who has been using the iPhone for sometime, I don’t prefer iCloud to backup my photos, videos and music. The main reason is the storage limitations that comes with it and it’s exorbitant pricing tiers compared to other cloud storage options. As I am running a windows machine, I also tired of the iTunes errors under Windows. Check WinX MediaTrans VS iTunes from here. WinX MediaTrans is a replacement to the expensive iCloud storage option and error ridden iTunes way. It provides a seamless backup and sync option to execute a selective backup (for example, move photo from iPhone to PC) or a backup of your entire media library between your iPhone and PC. It makes sure that your data is safe. The most popularly used aspect of WinX MediaTrans is to transfer iPhone photo to PC without requiring iTunes. 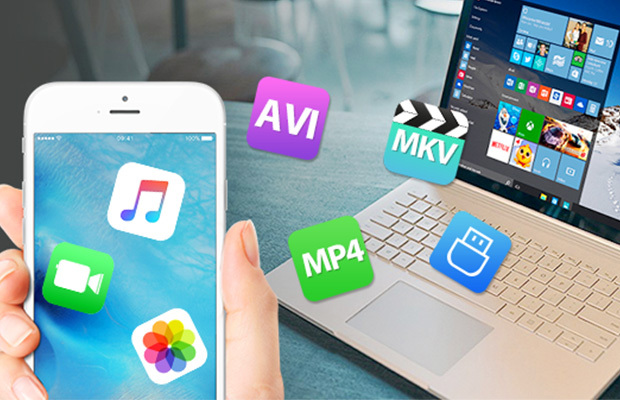 We will guide you through the process of moving photos from iPhone to PC using WinX MediaTrans without the help of iTunes or requiring an internet connection. Begin by downloading a licensed copy of WinX MediaTrans and installing on your PC. The WinX Media transfer dialog box will pop up on your screen. Select the “Photo Transfer” option and then choose the photos you wish to backup. Click the “Export” button to begin moving photos from iPhone to PC. That’s it. No wifi, no iTunes and a job well done. The transfer speed of the entire process is very fast. For easy comprehension, we tried moving 100 4K photos from an iPhone to PC. One 4K image is 4094×2160 and takes quite the space. With the help of WinX MediaTrans we were able to move iPhone photos to PC in just 8 seconds. That’s the fastest photo transfer I’ve ever done. Just make sure you disable the automatic syncing of data between your device and iTunes by going to iTunes -> Preferences -> Devices. Other features include the ability to manage iPhone’s music and playlist a lot better, when compared to iTunes. For me, music occupies the largest share of space in my phone and WinX Media Trans helps managing it in an effortless way. With the app I was able to do Two-way music transfers and backups between iOS and Windows 10. The data was intact with no loss or leakage. There are so many sorting option in the app, more than we can every think of and playlists that can be created in a few clicks as well. The energetic gym playlist that you were hoping to make one day or the sleepover lullabies you wish you had made are all a click away. 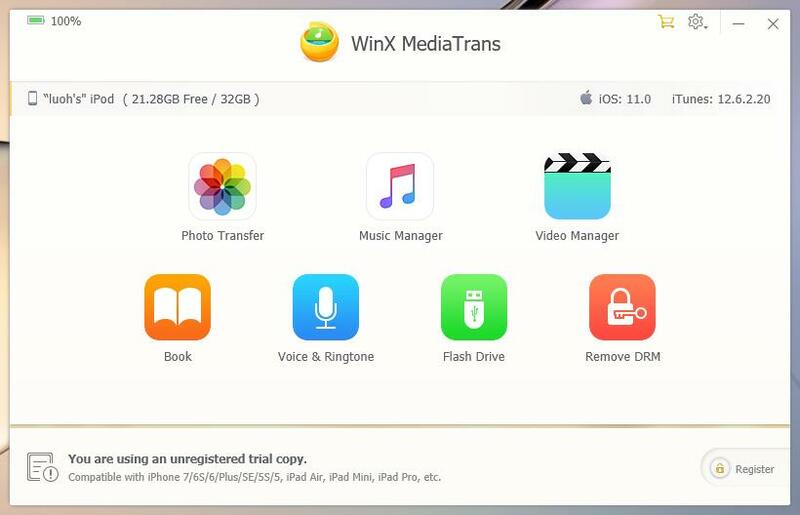 Not just photos and music, WinX MediaTrans can transfer your videos, eBooks, voice memos, etc between your iDevice and PC. More than that, it is capable of converting iOS-unsupported video format like MKV to MP4, converting audio to MP3/AAC, making ringtones with your favorite music, using your iDevice as a free USB to store any files. And to our great surprise, it can even unchain iTunes DRM, make your purchased iTunes movies, music songs, audio books playable on any device you own! With all that being said, WinX MediaTrans could be your one stop solution to manage your iPhone iPad or iPod. The good news is that, you can try your shot at owning this amazing software for free by entering their WinX MediaTrans giveaway hosted on their website. I hope this article was useful for you to learn about WinX MediaTrans. If you have any doubts with regards to this, let us know through the comments and we will be glad to help you out. If you have any suggestions regarding how we can improve the article, let us know them through the comments as well for us to improve. I just bought this program. I transfer a few images from my iphone 6 to my PC. After that, I continuosly receive an error message:”The device is busy. Please try again later”. But the device is not busy, I don’t have iTunes neither icloud. Also I didn’t change anything after transfering the first images. I ask for technical assistance, but nobody answered. Be careful don’t waist your money with this software.